Small, light, and safe – these are key features of your explosion-proof SPIROPLAN® right-angle gearmotors. With their light aluminum housing and compact design, they are the ideal application for those looking for compact angular drives. Looking for a modern right-angle gearmotor for your system architecture that runs smoothly, achieves top speeds, and is also explosion-proof? Then look no further than the SPIROPLAN® right-angle gearmotor from the W..EDR.. series. In addition, this gearmotor really saves on space thanks to its particularly lightweight design and small dimensions. The explosion-proof ATEX design complies with all the requirements of equipment group II. 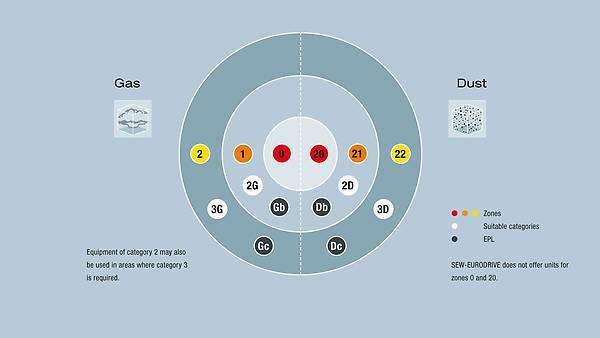 The II2GD and II3GD explosion-proof designs can therefore be used reliably in sensitive ambient conditions. 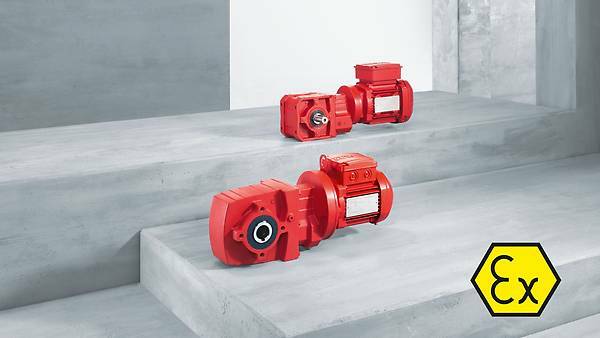 Benefit from a highly efficient drive solution with the SPIROPLAN® right-angle gearmotors from SEW‑EURODRIVE. These gearmotors are also exceptionally robust and low-maintenance. Thanks to their high-quality manufacturing and special design features, the explosion-proof SPIROPLAN® right-angle gearmotors offer you reliable durability and low-wear performance in lower torque ranges up to 180 Nm. The explosion-proof motors also offer great variety – the motor ot the series EDR.. allows you to choose from motor power ratings between 0.12 kW and 45 kW. The right-angle gearmotors enable top speeds at lower torque ranges. The SPIROPLAN® right-angle gearmotors boast particularly smooth and attenuated running properties. The right-angle gearmotors have a light and compact design, making them easy for you to install. For these sizes, the oil filling process is independent of the mounting position. This allows gearmotors to be installed in any mounting position without having to alter the oil quantity. The MOVIMOT® design – a right-angle gear unit with integrated frequency inverter in accordance with equipment categories II2D and II3D. The MOVI-SWITCH® design – a right-angle gear unit with integrated switch and protection function in accordance with equipment categories II2D and II3D.